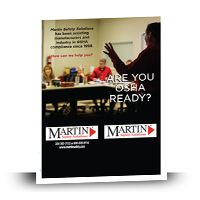 Martin Safety is ready with the right solution and product expertise to help your company with safety compliance and OSHA laws/standard changes. Our goal is to strategically partner with our customers to develop the best custom tailored safety solutions for your workforce. 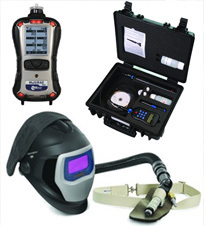 Fit testing ensures you have a proper fit and seal for a respirator. Improper fit can expose employees to gas, vapor, and fumes. Our staff is trained to perform these tests and will work with you to make sure that you are getting the protection that you need. Our assessments are a proven means of reducing injury and achieving related cost savings. We will go through your facility with a fine tooth comb, looking for present or potential hazards. From there we will make a customized recommendation based on your needs. Martin’s safety experts help our Customers by facilitating the standardization process, coordinating product testing and approval, documenting progress, and promoting standardization. Our PPE Standardization Program will reduce SKU’s and inventory levels while maintaining proper protection for employees. Choosing the right PPE is important, but ensuring correct usage and functionality is crucial. Martin will examine Safety equipment such as lifts, harnesses, and fire extinguishers. We will ensure that they meet all manufacturer guidelines and OSHA regulations. We will also instruct your employees on the correct usage for their PPE. This minimizes their chance of injury and gives them the confidence to work safely. Working with Martin Safety means receiving documented cost savings. We examine the full scope of work and show your Total Cost of Ownership. All training courses, as well as plant inspections, are assessed using the U.S. Code of Federal Regulations for General Industry, 29 CFR 1910. All training and processes are documented and presented in compliance with OSHA requirements. On a case-by-case assessment, we reserve the right to make changes or determinations based on individual needs. Training cannot exceed 40 participants per class. Many companies have unknown OSHA safety violations and other non-compliance issues which can cost thousands of dollars. Further, under unchecked hazardous conditions, companies can be held liable for employee injuries or death. Our plant site inspection simulates an OSHA inspection. We will conduct a comprehensive on-site safety evaluation for potential hazards and OSHA violations. Each inspection includes a detailed report of all findings. The report can be used as a guide for correcting any inadequacies or exposures, thus avoiding injuries, fatalities, as well as, fines from OSHA. In short, we inspect before OSHA inspects so you can protect your employees and address problem areas. This course adheres to the strict guidelines set by OSHA for proper training on Forklift Operation (29 CFR 1910.178). Includes classroom setting, lecture and multimedia presentation, workbooks, Q and A, and a standard test. OSHA also requires hazards to be discussed and pointed out as they pertain to forklift travel in your facility. 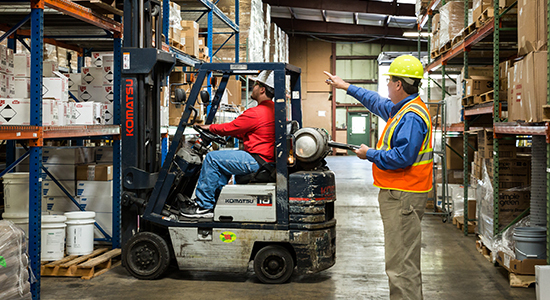 In addition to the classroom portion of the course, forklifts must be demonstrated, including successful navigation of an obstacle course by each operator. If multiple brands of forklifts, each must be discussed and operated safely. Every step of operator training is documented for your records. After a passing test score and successfully fulfilling each requirement, the operator will receive a certificate of completion and a drivers license. Licenses are valid for three years. Length of course: 4 – 5 hours. The purpose of this course is to teach the fundamentals of fall protection (29 CFR 1910.23 and 1910.132) . It addresses the hazards of slips, trips and falls. Addresses guarding floor and wall openings and holes, elevated walkways, drop off’s, railing requirements; and roll around step ladders. 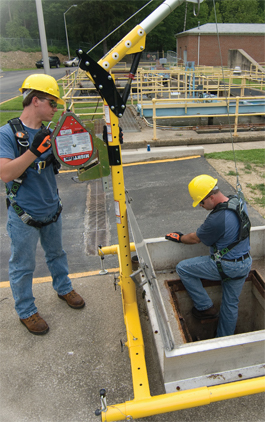 Addresses Harnesses and Lanyard usage, both where and when requirements; emergency rescue in event of a fall; various harnesses and harness configurations; various lanyards discussed; deceleration devices; rope grab devices; ‘descender’ devices for bridge crane cabs. This course provides information and training on precautions when dealing with blood, infectious materials and other biohazards (29 CFR 1910.1030). Addresses Universal Precautions; OPIM (Other Potentially Infectious Materials); written BBP plan in which to train your employees; engineering and work practice controls; Personal Protective Equipment for BBP; First Aid Responders; bio-hazards; hepatitis and various types; HIV/ AIDS discusses; protective measures; bio-hazard waste and disposal; pathways of entry for pathogens into the body; clean up after the accident; use of bleach; first aid kits and bio-hazard kits. 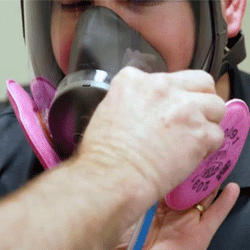 This course provides information on various types of PPE (29 CFR 1910.132, .133, Other) including but not limited to Eye, Face, Hand, Foot, Respiratory, Hearing, Head protection. Individual topics can be lengthened. Addresses when and what PPE is necessary; the proper care, maintenance, useful life of PPE; employers responsibilities to provide PPE; employee’s responsibilities to wear and use all appropriate PPE; employee owned PPE. Course also provides information on various PPE types, shapes, sizes, colors, differences in similar PPE; respirators; clothing type PPE; Tyvek; and Level A,B,C, D type PPE clothing. This course provides the necessary training to protect against hazardous airborne substances. Addresses the respiratory hazards to which employees are potentially exposed during routine and emergency situations. Addresses requirements and overview of OSHA standard; respiratory hazards, including immediate and delayed effects; respiratory protection factors; employer responsibilities; employee responsibilities; types of respirators, protection factors, evaluation for use, and limitations; respirator qualitative and quantitative fit test; and respirator care and maintenance. Course includes information on air sampling and safety data sheet reading for determining the appropriate respirator needed. This course covers specific OSHA standards and requirements as they apply to general industry with the intention of raising safety awareness. Refer to the OSHA 10 Hour for additional topic information. 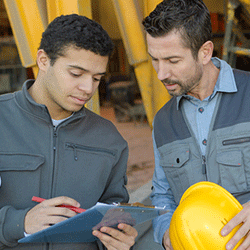 OSHA 30 Hour is more appropriate for supervisors and employees with safety responsibilities. OSHA 30 addresses in depth the Code of Federal Regulations in reference to safety and health. Individual Topics for the OSHA 30 are strictly mandated and will be taught as required. Upon successful completion, participants will receive an official OSHA 30-Hour General Industry Outreach course completion card from an OSHA Training Institute location. All segments of the course are documented. Documentation of this course will be kept by Martin Safety Solutions for 5 years as required by OSHA. Under OSHA’s 29 CFR 1910 standards, all companies with 10 or more employees are required to provide regular safety training. This course covers essential safety topics, such as general safe work practices, fire safety, and awareness and control of common safety hazards. Because companies have varied work environments, site-specific training will also be tailored to fit a company’s needs. All segments of the course are documented. All documentation will be kept by Martin Safety Solutions for 5 years as required by OSHA. Regular recurring safety training available: monthly, quarterly, bi-annually, yearly. A company must have an EAP for its facilities whenever a specific OSHA standard requires it (Subpart L and 1910.38). An EAP is required, for instance, where employees are required to evacuate when a fire alarm is sounded. Companies must also develop an EAP if they have a fixed extinguishing systems and fire detection systems. The purpose of the EAP course is to aid your company and employee responses, such as evacuations, during workplace emergencies. It addresses action plans for emergencies. It also discusses clear paths of travel; exits; clearance around exits; fire extinguishers and usage. It addresses the requirements of a written Emergency Action Plan tailored to your facility in the event of emergency; training for the Emergency Plan; alarms and what the alarm shall be at your workplace. Lockout tagout is a safety precaution for ensuring proper shut off of machinery(29 CFR 1910.147). Companies utilizing heavy-duty mechanical, electrical, hydraulic or pneumatic machinery must comply with certain lockout tagout requirements, including training and follow-up. This course informs employees of proper lockout tagout procedures to be used during repair and maintenance of equipment. This course provides knowledge of the OSHA requirements for the safe release of various energy sources; safe work practices; the use of locks; the use of tags and requirements; filling out tags; placement of locks; discussion of various lockout devices; techniques; multi-man lockout procedures. Discussion also includes the required, custom-tailored ‘written Lockout and Tagout’ safety program; re-energizing equipment; authorized, affected and ‘other’ employees. This course addresses the OSHA requirements for machinery(29 CFR 1910.212), including: safe lubrication and adjustment of machinery; various guards and guarding techniques; location and distance; light curtains, fixed guards, prox switches, etc. This course is intended for all employees working in and/or around machinery with hazards involving ingoing nip points, rotating parts, flying chips and sparks, and other hazardous points of operation. This course provides training to meet the requirements for Confined Space Entry as set forth by OSHA (29 CFR 1910.146). It addresses “Permit Required” vs. “Non Permit Required” confined spaces. It thoroughly addresses Permit Spaces; need for training; the permit and what is on it and why. Addresses various hazards found in some confined spaces; hazard evolution in spaces; 19.5 to 21.0 % good air required; air monitoring spaces; history of Confined Spaces; depleting air when working in a space; rescue requirements; posting the permit; training or entrants ; not deviating from the permit work. Discusses job of the attendant; requirements for attendants; continual monitoring of the Permit Space. Addresses requirements of a tailored Permit Required Confined Space written safety plan for your facility and your spaces as required by OSHA.bs. This course covers portable hand tools and power tool safety (1910.334, .242, .266, .304); keeping tools in safe working order; inspecting tools regularly; employer responsibility pertaining to safe conditions of powered hand tools; grounding tools; keeping tools sharp; guards kept on tools; storage of hand and powered tools; air tools; use of PPE. This course provides training on Hazard Communication Standard and the required written HAZCOM safety plan as it should be tailored to your company (29 CFR 1910.1200). It addresses OSHA’s major changes to the standard and how it is aligned with the United Nations Globally Harmonized System of Classification and Labeling of Chemicals (GHS). It also provides a common and coherent approach to classifying chemicals and communicating hazard information on labels and safety data sheets (SDS). It addresses guidelines for improving the quality and consistency of hazard information in the workplace and training on appropriate handling and safe use of hazardous chemicals, including PPE and storage of chemicals. This voluntary course is recommended as an Outreach Training Program orientation to occupational safety and health designed for entry level employees involved in general industry workplaces. It provides training on the recognition, avoidance, and prevention of safety hazards in general industry operations. The course also provides information regarding employer responsibilities and employee rights. Applicable OSHA acceptable course safety and health topics are determined and selected by the company based on their needs. Review the previous topics to determine which topics are applicable for your workplace. (note: if a topic is not listed, OSHA allows some legitimate safety topics to be substituted as an alternative. However, most topics are strictly mandated by OSHA and will not be deviated from for this course. All mandated OSHA topics will be taught. OSHA mandates that this course ‘shall be’ a one and one half day in length (7 hours first day, 3 ½ hours second day); course must last 10 hours in length, not including breaks or lunch. The course will also include the NEW Mandatory 2 hour Introduction to OSHA Module. Presentation will be multimedia and lecture directed by an authorized OSHA Outreach Instructor. Written materials will be provided. Upon successful completion, participants will receive an official OSHA 10-Hour General Industry Outreach course completion card from an OSHA Training Institute location. All segments of the course are documented. All documentation will be kept by Martin Safety Solutions for 5 years as required by OSHA. If you have projects outside your normal course of work and will need specialized equipment, Martin has an extensive rental offering available. This provides you with the flexibility to get jobs done as safely as possible while at the same time ensuring that you are not limited by finances. First Aid / Eyewash / and MORE! 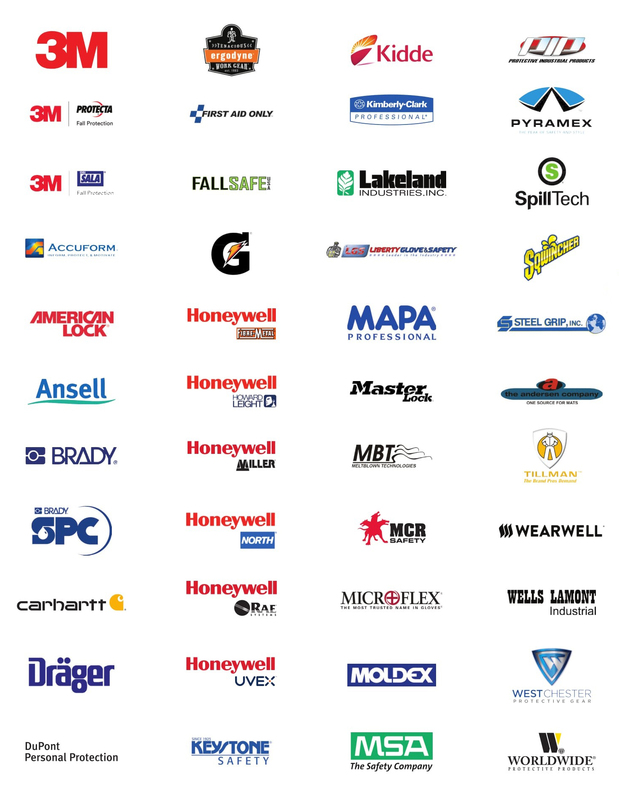 These are our strategic safety suppliers. Please contact your Martin representative if there is a brand not listed that you would like quoted.